(On hold) This is a 1920s Parker Lucky Curve "ring top" button-filler fountain pen in black chased hard rubber (BCHR) with a 14k gold XXF full-flex nib. The pen has been restored, which included a complete disassembly, a gentle cleaning, an overhaul of the filling mechanism, ink flow adjustment, a nib tune-up, and a gentle polish with a soft cloth (by hand). This is a superb example of the well-respected and highly collectible Parker Lucky Curve from the 1920s. It's in amazing condition, without any trace of wear or fading, which plagues the vast majority of BCHR pens from that era. The pen looks as good as new, and it would be a perfect specimen for the high-end collector. The imprint is strong. The pen was designed specifically with Spencerian penmanship in mind. It's a classic "ring top," meant to be worn around one's neck, so it's a lightweight, compact pen when capped (4.5"). However, it converts to a full-size pen when posted (5.7"), as it is meant to be used that way. In terms of ergonomics, the pen resembles those of a well-designed dip pen holder, with a somewhat long, streamlined shape and great balance. It's extremely comfortable to hold, lightweight, and very pleasant to the touch. The button filling mechanism works flawlessly and holds a lot of ink. The pen is a calligrapher's tool, a high-precision writing instrument, capable of producing beautiful penmanship. It was designed for a skilled hand, and will perform as well as any flexible pen of that era. I would rank it as a "full-flex," just shy of being a wet noodle, but it offers excellent flexibility, and fantastic snap-back. With light pressure, it writes an XXF line of about 0.3 mm (on my paper), and you can get the line even thinner if you use dry ink and dry paper. The nib excels at transitions between hairlines and swells, which is the cornerstone of Ornamental Penmanship. If you are new to flexible nibs, this pen is probably not for you, unless you're willing to learn its dynamics and try to write with a light hand. The best news is this pen had not been used much in the past, if at all, which means the nib is free from any (invisible) damage that many vintage flex nibs develop over time (due to using excessive pressure). The tipping material is ample and of perfect geometry. (Sold) This is a 194 Blue Diamond Parker Vacumatic Major fountain pen in Golden Pearl celluloid, with a 14k gold, two-tone XF Full-Flex nib. The pen has been restored, which included a complete disassembly, a gentle cleaning, an overhaul of the filling mechanism, ink flow adjustment, a nib tune-up, and a gentle polish with a soft cloth. This is a full-size pen, and it measures 5.1" capped and 0.48" in diameter. Parker make a few kinds of nibs for its highly successful Vacumatic line. They all share one thing in common - a superb writing performance. The nib's ability to write a consistent, juicy line and its soft, gliding feel rank among the best ever made. Today, decades after the last Vacumatic left the factory, very few modern nib makers can boast a similarly high level of nib design, engineering, and craftsmanship. Most Vacumatic nibs are of the firm variety. After all, the pen was guaranteed for life (the Blue Diamond series), and a firm nib was more resilient to heavy-pressure writing. The Janesville company also made a semi-flex nib, which is less common, but equally good in terms of performance. A discerning customer was also able to special-order a fully flexible nib that was designed specifically for Spencerian and Ornamental Penmanship. Such nibs are very rare today, and, understandably, remain highly sought after by calligraphers and collectors alike. The pen I am offering today comes vested with a rare, two-tone XF Full-Flex nib. With light pressure (i.e., "normal writing"), the pen writes a fantastic XF line of about 0.3 mm. With increased pressure, the tines open up with ease to produce a wide and juicy line of up to 1.3 mm, with excellent snap-back. Many flexible vintage nibs on the secondary market have signs of having been abused, flexed outside of their normal range. This nib, however, is perfect, virtually without any signs of use. It has ample tipping material, of excellent geometry. The tines are perfectly aligned, and I tuned the nib to write a somewhat wet line with light pressure so that you can take advantage of its ability to write a beautiful hairline with a light hand. For the best calligraphic effect, I recommend that you use a dry-writing ink (here, a KWZ IG Violet #3), which will enable you to get very subtle gradations of line width, necessary for the graceful transitions between hairlines and swells in Ornamental Penmanship. This pen will perform at its best in a skilled hand. If you don't have much experience with vintage flex nibs, I recommend that you go slowly and gently, at least at first. High-quality flex performance is not about how soft the nib is or how wide it opens up. Rather, it's about the nib's responsiveness to minute variations in pressure, and this nib excels at that. Cosmetically, the pen is simply gorgeous, without any flaws or defects. The celluloid has a vibrant color of incredible depth and chatoyancy. Barrel transparency is very good, the imprint is strong, and the gold-filled trim as good as new. Quite honestly, this is a beautiful pen. The only issue is a very slight plating loss on the nib, which happens to the vast majority of 1940s Vacumatics, and it has no bearing on performance. (SOLD) This is a mid-1940s Eversharp Skyline fountain pen in Navy Blue, with a gold-filled cap, and a 14k gold XF Flexible nib. The pen has been restored, which included a complete disassembly, gentle and careful cleaning, an overhaul of the filling mechanism, ink flow adjustment, a nib tune-up, and a gentle polish with a soft cloth (by hand). I work according to current "best practices" in pen restoration and I use high-quality replacement materials. This is a full-size Skyline, measuring 5.2" capped, and 0.45" in diameter. The phrase I wrote comes from an Eversharp advertisement and, though it does seem a bit trite today, I do believe that the Eversharp Skyline is the one vintage fountain pen to own if you want to experience that famous writing ability and superb ergonomics. The Skyline, one of the most iconic pen designs of all time, was a desirable pen then, and it is a desirable pen now. Two reasons: (1) superb ergonomics and timeless design, and (2) fantastic writing performance, esp. with a flexible nib. This particular Skyline is in excellent condition, certainly used very little in the past, if at all. There are subtle clues as to its provenance, and, judging by the pristine quality of the nib, I'd say this pen as close to new-old-stock as it gets. The material is deep, rich, and vibrant, and the gold-filled trim is in equally great shape. A beautiful specimen! I get a lot of requests for a vintage flex pen. Unfortunately, vintage flex pens have gone up in price significantly over the years. To make it worse, a lot of flex nibs on the second-hand market have signs of having been abused, flexed outside of their designed range. The most economical way to a quality vintage flex is the Skyline. 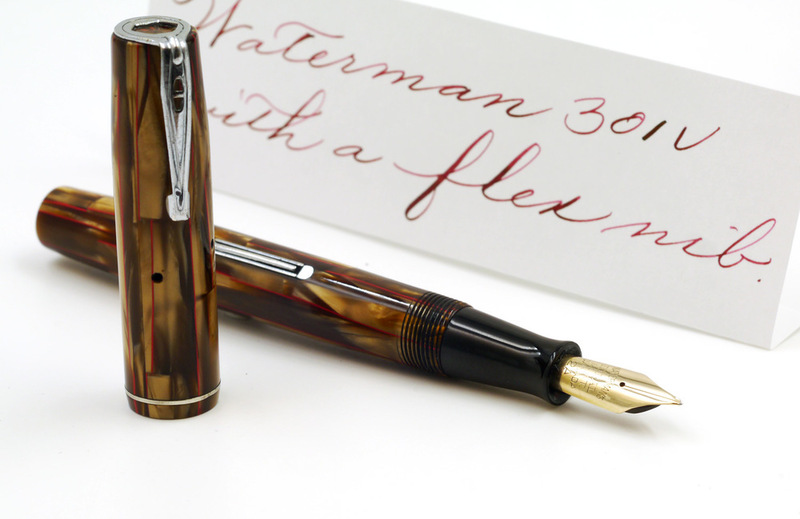 No, it's not the cheapest flex out there, but it is well worth the price, which, by the way, is significantly less than a Waterman 52 of comparable performance. The nib is an ideal flex nib for someone wishing to write Spencerian or Ornamental Penmanship. It has an extra-fine point, capable of writing a hairline of 0.2 mm with a light hand, and it opens up easily to at least 1.2 mm. That puts it in the vicinity of a full-flex nib. The nib has not been "broken in," which means it is free from microscopic discontinuities, cracks (i.e., material fatigue) that plague so many vintage flex pens, so it will not feel as soft as a wet noodle, but that is a good thing. It will give you more control over your line, such as gentle transitions between hairlines and swells. The tipping material is of excellent geometry, and the tines are in perfect alignment. Flexing is not all about the range, it's also about the incredible, oversize ebonite feed that never starves for ink, and delivers just the right flow for all the detail you need in your handwriting. It's also about the "snap-back" property, which this nib definitely excels at. If you are new to vintage flex, this would be a great "first vintage flex" pen, but I do advise you to be careful and give yourself ample time and opportunity to familiarize yourself with the pen, how it feels, and what it's capable of. Though the nib is designed as a flexible nib, you need to be careful not to spring it. (SOLD) This is a mid-1930s Sheaffer Balance "500" Vac fountain pen in striated Marine Green celluloid, with a 14k gold, two-tone Feathertouch XXF Semi-Flex nib. The pen has been restored, which included a complete disassembly, a thorough cleaning, an overhaul of the filling mechanism, and adjustment to ink flow, nib tuning, and a gentle polish with a soft cloth (by hand). The pen is also know as a "500" and it measures 4.8" capped and 0.42" in diameter. This Sheaffer Balance will make a great precision writing instrument with which to write or learn a business cursive or Spencerian penmanship. The nib is ground to a needlepoint tip, and it is semi-flexible, giving you reliable line variation of about XXF-BB. It is not a full-flex nib, but the tines open up nicely and spring back quickly, giving you a tool that's bound to add character to your handwriting. Being such a fine point, the nib has a bit of a tooth, but it is perfectly aligned, with excellent tipping geometry. It writes consistent strokes in virtually all directions, but it does perform at its best with a light touch. The oversize ebonite feed provides a steady and reliable flow of ink. If you like broader nibs and write with a heavy hand, this pen is not for you. Cosmetically, the pen is in excellent shape. The celluloid is deep, rich, and vibrant, with very good barrel transparency (with some "ambering" present). The filling mechanism works like a charm, holding a lot of ink. The gold-filled trim is in excellent condition, as well. A really handsome pen! The orange tones you see in the barrel is the wood background showing through the transparency. (sold) This is a 1945 Blue Diamond Parker Vacumatic Major in Azure Blue Pearl celluloid, with a 14k gold Fine, Semi-Flex nib. The pen has been restored, which included a complete disassembly, a thorough cleaning, an overhaul of the filling mechanism, ink flow adjustment, a nib tune-up, and a gentle polish with a soft cloth (by hand). I work according to current "best practices" in fountain pen restoration, and I use high-quality replacement materials and specialized tools. It's so incredible that Parker was able to design and manufacture the Vacumatic while, in 1945, most of Europe, Japan, and other parts of the world lay in ruin after the devastation of World War II. Despite a severe economic and political crisis, material and labor shortages, the Janesville company created this amazing writing instrument. Mind-boggling, don't you think? The Parker Vacumatic is known even to fountain pen novices for its beauty, an advanced filling mechanism, and writing performance. This particular model is in exceedingly great shape. The Azure Pearl celluloid is deep, rich, and vibrant. Barrel transparency is excellent, so you can watch the pen fill, and gauge remaining ink level with ease. The gold-filled trim is in equally great condition. Quite simply, this is a stunning pen. If you saw it alongside the latest Visconti or Pelikan, you'd think it was a gorgeous modern pen, and you'd expect to pay a significant premium for it, but you can have it now for a lot less. The nib is a dream to write with. It was made in a process that is mostly lost to us. Yes, there are some white papers and patents available in archives, but the actual methodology and the human touch required to make these nibs are gone forever. Unfortunately, there is a finite number of these pens still available and I would not hesitate to buy one now, as sooner or later, they will completely disappear from the vintage pen market, some to be safely guarded by collectors, others to end up in the trash. The nib lays down a smooth, wet, Fine line (about 0.4 mm on my business paper) and it provides that highly desirable gliding, almost hovering sensation. The nib does a great job absorbing micro shocks and gives you a cushioned ride, but without disconnecting you from the paper. You're always in control, and if you press harder, you will be rewarded with a subtle "give" and nice line variation. It is not a full-flex nib, so please don't press too hard, but you can easily get the F-BB variation, perhaps more. This nib is bound to add a lot of character to your handwriting, regardless of your writing pressure. (SOLD) This is a 1946 Blue Diamond Parker Vacumatic Major fountain pen in Golden Pearl celluloid, with a 14k gold Fine semi-flexible nib. The pen has been restored, which included a complete disassembly, a thorough cleaning, an overhaul of the filling mechanism, an adjustment to ink flow, a nib tune-up, and a gentle polish with a soft cloth (by hand). I work according to current "best practices" in pen restoration and I use high-quality replacement materials. When Parker created the Vacumatic, it was truly a revolutionary pen (the phrase I wrote comes from a Parker ad). First of all, the graceful lines of the pen are not only ergonomically sound, but they are also undisturbed by any visible filling contraption such as a lever or a crescent. The filling mechanism is accessed by unscrewing the rear (blind) cap to expose a plunger mechanism. Next, we have the laminated celluloid, created by stacking up overlapping layers of clear and opaque celluloid, thus creating this timeless pattern of breathtaking beauty and great functionality. It allows you to clearly watch the pen fill and gauge remaining ink level with ease. Speaking of ink level, the Vacumatic has a huge ink capacity, easily holding up to 1.7 ml of ink. It was a lot then, and it is a lot now. Very few modern pens can boast such as large ink reservoir. Finally, there's the 14k gold nib. It's one of the best nibs ever made, in my opinion. Made in a process that's largely lost to us, the nib has an impressive ability to absorb vibrations coming from dragging the point across the paper. The nib feels soft and smooth, but without inhibiting its writing ability. The point is ground such that it writes under the lightest pressure, laying down a consistent line, regardless of stroke. Again, very few modern nibs can match this level of writing ability. When I tune a vintage nib, I try to preserve its original character as much as possible. It would be easy to just polish the writing surface with Micro-Mesh, but it would alter the nib's personality and hinder its original writing ability. If you write with a heavy hand, this nib is not for you, as the tines will spread, increasing line width and ink flow. This nib really shines when writing with a light touch, and pressing harder only to add character to your writing, a little bit of line variation. I'd rate this nib as a semi-flex, meaning that it will easily produce a line of F-BB width. However, be careful not to spring the nib. If you're used to writing with a Noodler's Ahab or Konrad, you might be tempted to press hard, but I caution you not to do that. Start by increasing pressure in very, very small increment, and you will be rewarded by a beautiful line! Cosmetically, this is one of the nicest Vacumatics to come across my desk in a while. The gleaming celluloid is rich, deep, and vibrant. Barrel transparency is excellent, and there are not flaws or defects of any kind. The gold-filled trim is in equally great shape. A beautiful pen! It would make an awesome daily writer (except on cheap office paper), and would be a fantastic gift for a close friend or family member to celebrate a special occasion. If you do buy it for a gift, please let me know and I will include a nice box with the pen. Parker Blue Diamond Vacumatic Major, F Semi-Flex, capped. The orange tones in the barrel result from the background showing through the transparent material. (SOLD) This is a mid-1930s Parker Deluxe Challenger fountain pen in Green and Black celluloid, with a 14k gold Extra-Fine semi-flex nib. The pen has been restored, which included a complete disassembly, a thorough cleaning, an overhaul of the filling mechanism, ink flow adjustment, a nib tune-up, and a gentle polish by hand. This is a larger pen, measuring 5" capped, with a barrel diameter of 0.48". My customers often write to request a pen of certain features, including (1) beautiful celluloid, (2) silver-color trim, and (3) an XF flex nib, (4) great condition and a low price. Needless to say, vintage pens that meet one of these criteria are rare, but pens that meet all four are downright scarce. However, todayI have a pen that meets the four criteria, and should, therefore, prove popular. Parker, being such a huge and dominant pen company, had a diverse catalog, spanning the entire range of sophistication and affordability. North of the mid-point of that range, sat the Deluxe Challenger, a beautiful, chunky pen, equipped with a button filling mechanism, and a very pleasant semi-flexible gold nib. The pen posts very nicely, so it truly is a full-size pen, and it should be comfortable even for people with larger hands. The first thing you notice is the gorgeous Green and Black celluloid. It is deep, rich, the green accents having a lot of chatoyancy. The nickel-plated trim (similar to that found on Vacumatics) is in very good shape, too. The pen has the characteristic ball clip, and not the later trademarked arrow clip that Parker pens are known for. A very interesting, if somewhat lesser known, pen! The nib is really special. It lays down an extra-fine line (0.3 mm, depending on your ink, paper, and writing pressure) and has a nice amount of spring to it. In fact, I would call this nib a semi-flex, as it does open to at least B, maybe even BB. In a skilled hand, this will be an excellent pen for business cursive, Spencerian handwriting (including some swells), and even D'Nealian. It will also make a great pen with which to learn the Palmer Method or Spencerian penmanship, and for those of you simply who wish to improve your handwriting. (SOLD) This is a late 1940s Eversharp Symphony Fountain Pen and Pencil set in Burgundy, with gold-filled trim, and a flexible 14k Medium nib. The set appears to be new-old-stock, with all original parts, and a sticker still in place. I made sure the set worked properly, adjusted the nib and ink flow, but kept the original sac, as it was pristine. I cleaned the set and gave it a gentle hand polish. Eversharp advertised this set as "A luxury set at a pre-war price." Even today, I'd consider Eversharp Symphony the most affordable true vintage flex pen. I've been getting a lot of requests for affordable vintage flex. To be honest, it's almost an oxymoron, as the demand for vintage flex is at an all-time high. Still, I was able to source this exciting set for you, and I am offering it at an affordable price. I'd rank the nib as a medium flex, possibly even close to full-flex. It's soft and springy. It's nominal width is a Fine, though it was sold as a Medium. It has ample tipping material of perfect geometry. A smooth writer and will give you the line variation you seek. Cosmetically, the set looks like it had not been stored in favorable conditions. There's one small nick on the top of the cap, and a couple of small blemishes here and there, but, otherwise, it's in an unused condition, at least judging by the internals. The pencil work, and I filled it with new 0.9mm lead. (sold) This is a 1939 Parker Parkette Zephyr fountain pen in Gray celluloid with a 14k gold XF semi-flex nib. The pen has been restored, which included a complete disassembly, a thorough cleaning, an overhaul of the filling mechanism, ink flow adjustment, nib tuning, and a gentle hand polish. In the late 1930s, Parker was struggling somewhat, particularly, in the affordable segment of the market. The company decided to suspend its long-held belief that there should not be a lever on a pen's barrel, and designed an economically priced, Parkette. This particular model is made of beautiful celluloid, comes with a nice ink window ("Visometer"), and a semi-flexible 14k gold nib. Today, such a pen would command a premium, costing upwards of $400, easily. But you can enjoy a restored Parkette for a fraction of the price. The pen is in very good condition, without any flaws or defects. The celluloid is rich, deep, and vibrant, the gold-filled trim is quite good, too. The ink window has some ambering but it is usable. The main attraction of this pen is the 14k semi-flexible XF nib. It writes a somewhat wet, smooth line that will widen with increased pressure. A very pleasant writer, this would be an ideal first vintage pen for a novice fountain pen enthusiast. You would be hard pressed to find a modern pen of similar good looks and performance at a reasonable price. The phrase I wrote comes from a Parkette advertisement. (sold) This is a standard size, early Eversharp Skyline in Navy Blue with a Red and Green striated celluloid cap (measuring 5 1/4" capped). The pen has a visulated section and a flexible Fine 14k gold nib. The pen has been completely disassembled, thoroughly cleaned, the filling mechanism overhauled with the highest-quality replacement parts, the ink flow has been adjusted, and the nib tuned. A gentle hand polish completed the restoration process, followed by testing with ink. The Eversharp Skyline, introduced in 1941, is one of the best pens ever made. Most vintage pen aficionados seem to be in agreement about that. The company used an aggressive and inventive advertising campaign to sell the pen as having an advanced ink delivery system (even safe for flying) and a gorgeous, unique design, credited to Henry Dreyfuss. While the advertised features are generally interesting, to me, the Skyline wins because of its incredible ergonomics and fantastic 14k gold nibs. Have you ever used a modern OMAS Extra Flessibile nib? Well, the Skyline nib is similar, only better. This particular nib is flexible, by design, and is in excellent condition. It writes a Fine line, but opens up really nicely to at least BB, perhaps wider. I am not a fan of pushing flexible nibs too hard, so what you see in the writing sample is a conservative degree of flex that I dare try. The nib has a unique feel, a very pleasant sensation, of gliding across the plane of the paper, as if hovering above it, while still being connected to it. No other nib (except the OMAS) feels like that. It has just the right amount of tipping material, and of perfect geometry, so there's going to be no issue with hard-starts or skips. The line is as confident as it gets. The other winning feature is the pen's ergonomics. It's a streamlined shape that feels just right in thehand. The cap posts very deep, so you're never bothered by it, a property that I wish more modern pen makers would build into their pens. Visually, the pen is stunning. The Navy Blue body is smooth, rich, and vibrant. The visulated section looks as clear as if it was made yesterday. The Red and Green striated celluloid cap is gorgeous, as is the gold-filled trim, and the instantly recognizable derby. It seems that a lot of people are interested in vintage flex pens, particularly Waterman, and for good reason. Waterman, in the first half of the 20th. century, made a lot of beautiful pens with incredibly good flexible nibs. However, these pens are rather pricey and scarce. The Thorobred, made in the 1930s, is a great, full-size pen. It's made out of gorgeous brown, red-veined celluloid, and has chrome trim. The nib is the same #2 nib that people know and love. This one is extra-fine in width when writing with normal pressure, and opens up nicely with heavier pressure. This is not the softest nib I've ever used, but it does fall into the "medium flex" category, and can be used for shaded writing. The XF line is great for hairlines! This pen would make a great, affordable "first vintage flex" pen. Contact me if you're interested. Thanks!